One of my favorite parts about China Glaze’sWinter 2010 Collection “Tis The Season… To Be Naughty Or Nice” is that I am super indecisive and it caters to that part of my personality. This collection has some truly sweet and innocent shades , but it also harbors some seductive selections that are sure to spice up your holidays. Since I run a nail art blog and since tons of full swatches of these shades are already circulating the net, I hoped you’d be okay with my doing skittle swatches- I mean, there are 16 shades after all! Snow is a great go to white- basic creme with little to no chalkiness. 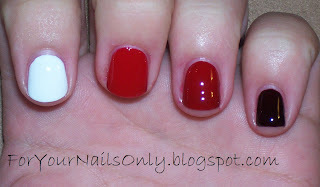 Ruby Deer is a fire engine red creme, great coverage, a little staining. Phat Santa is a deeper brick red, more staining, but more up my alley. Naughty And Nice is a dark black/purple went on smooth as silk and was a breeze to clean up. 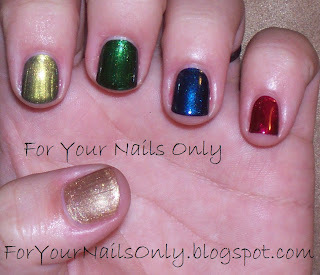 Obviously these colors are have many dupes buts for the holidays are definite nail polish staples. Favorite? Naughty And Nice- like OPI’s Lincoln Park After Dark but with more brown. Frosty is a “glue-like but better” color with tiny iridescent glass flecks; an original color, I love it! 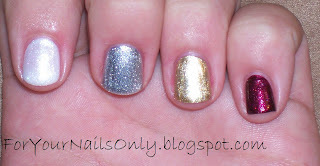 Jingle Bells is a gold polish with gold glass flecks, a golden version of Cheers to You with less foil. Sugar Plums is an amazing black raspberry shade with tiny holographic flecks, so when it catches the light right, it glistens just like sugar. Definitely my favorite from these four and reminds me of my first franken, Kiss My Plum. Jingle Bells is just like OPI’s Golden Rules but with streaks. Would be great for stamping. Peace On Earth is an amazing olive shade- green with yellow shimmer and I’ve not seen one like it. Perhaps Zoya Irene? I’ll have to check. Jolly Holly- YUM. A perfect emerald green. It has so much depth that this is one of my favorites from the entire collection. Little Drummer Boy is another deep rich jewel toned shade. You look at this polish and you get lost in the midnight sky. Mommy Kissing Santa is your standard raspberry plum shimmer/frost, but its beautiful in its own right, though it dried slightly bumpy like China Glaze Riveter Rouge. This hand had some great jewel tones and are, again, some great staple polishes if you don’t have shades like these. Mrs. Claus is a candy apple red with silver glitter. When built up for opacity, the glitter appears pink/red and it covers very smoothly. Mistletoe Kisses is a green Mrs. Claus but what Mrs. Claus does with three coats, Mistletoe Kisses does with two. I love this color so much; its a jade green with silver glitter. 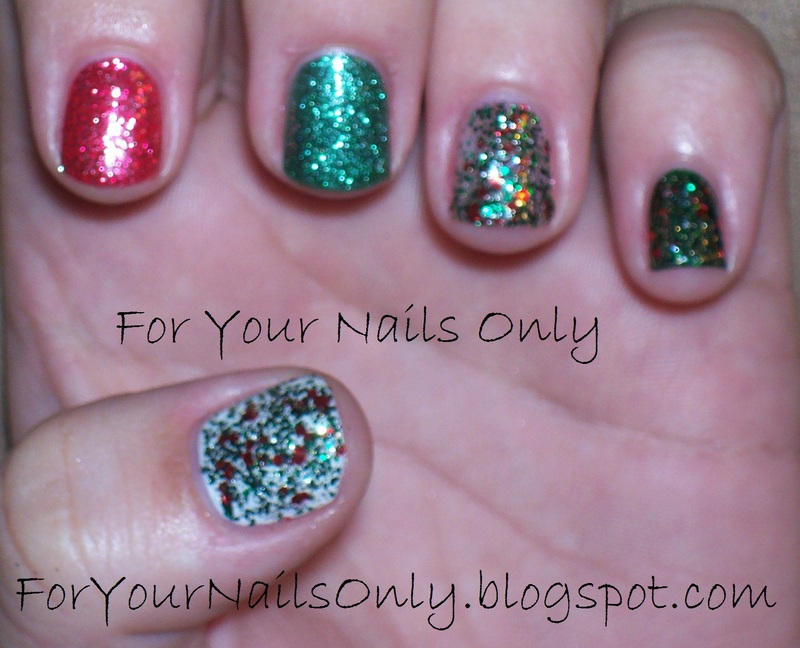 Party Hearty is a multiglitter topcoat with green and gold round glitter and and red hexes. It looks great on its own or layered over white for background color, but my favorite is when it was layered over green because it makes the gold more visible. 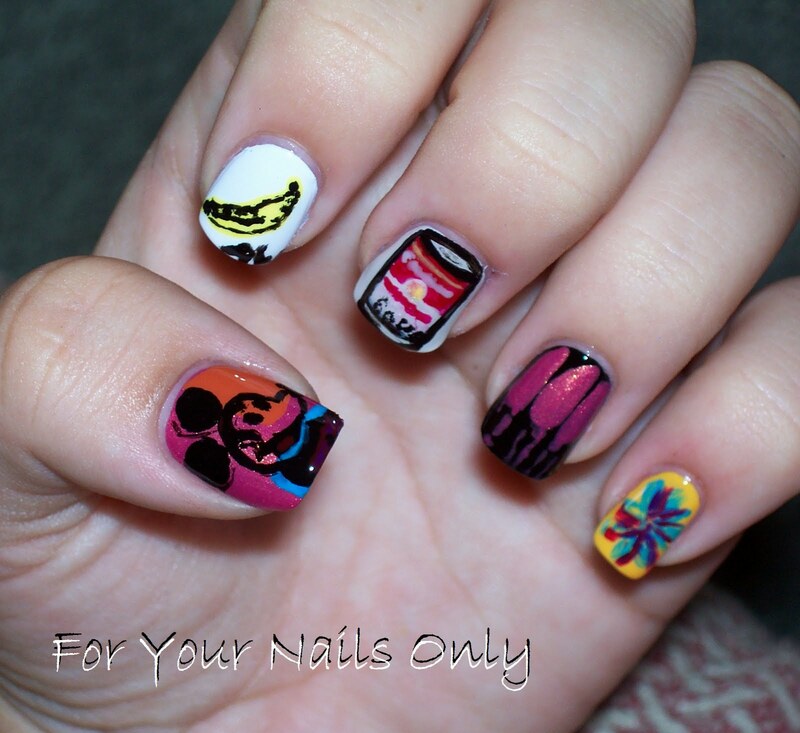 Overall, the formula on these was wonderfully smooth and applied generally in two coats or less. The only one I had a bit of trouble with was Snow, but that’s because its white and to be expected. The jewel tones performed the best for me with one coat for full coverage, fast drying time, and for the most part smooth finishes. My absolute favorites from the collection are Sugar Plum, Mistletoe Kisses, Jolly Holly and Little Drummer Boy. These polishes are already available at etailers like www.transdesign.com and 8ty8beauty.com so you better grab them before the sell out for the holiday season! Suggested retail for China Glaze polishes is $6.50 per bottle. Don’t forget to stock up on the holiday gift sets mentioned in my previous press release. il art with these in the near future so keep an eye out, and behave or Santa will give you coal for being naughty…. Upon looking through Melissa’s archives at The Daily Nail, I happened upon a splendid design for one of my favorite musicals of all time: Chicago. Her design was specific to that show, and mine is a tad more generalized to the era. For this manicure I used one coat of OPI’s Natural Nail Base Coat, two coats of a mix of Sally Hansen’s Lavender Cloud and Icing’s Go For the Gold for the skin, Nicole By OPI’s Deeply in Love for the red corset, and Sinful Colors Black on Black for the tiny details. Topped off with two coats Seche Vite. All of the colors here (and their mixtures) have been covered in my archives somewhere, so I’m just going to do a brief blurb about my base and top coats. Base coats are extremely important for all nail polish wearers, both the daily-changer like myself and the once-in-a-blue-mooner like many others I know. It keeps your nails from becoming stained by the polish (especially pigmented polishes like red, dark blue, and dark purple). It also keeps your polish “stuck” to the nail which helps your manicure last longer. I personally love OPI’s Natural Nail Base Coat because it’s a thinner base coat that really does grab the polish and adheres it to the nail. I would like to try a ridge filling base coat, but I haven’t gotten my hands on any yet. Top coats are equally as important because without them, your polish will smudge easily, take forever to dry, and chip or peel relatively soon after your finish your manicure. I personally adore Seche Vites Dry Fast Top Coat because you can use it on wet polish and it doesn’t smear your work, it dries in NO time at all, it gives your manicure a professional finish with super high gloss shine, and it makes my manicure last until I want to take it off. For holographic and matte polishes, a top coat isn’t used or it will ruin the texture. 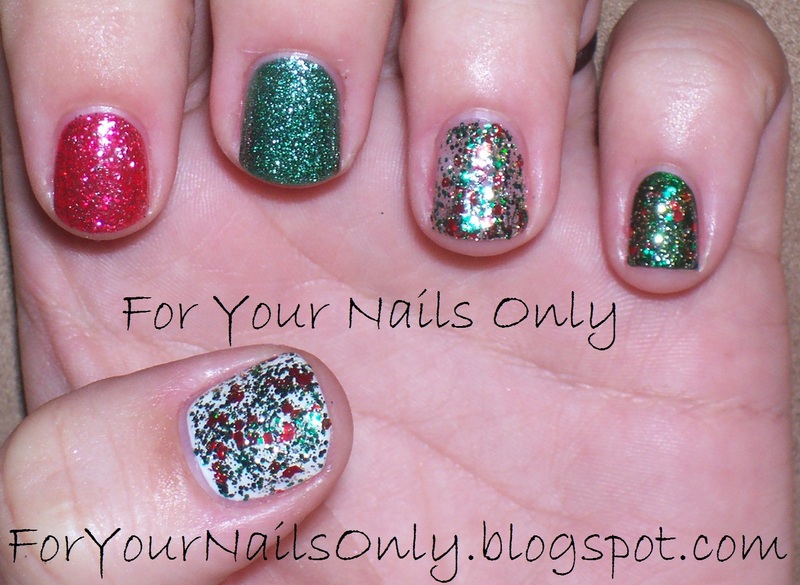 A top coat will prevent the light from reaching holographic glitter as much which will decrease the effect. Also, putting a top coat on matte polish will make it shiny again, which would defeat the purpose!!! First, remember to enter my giveaway- its a few posts down and runs until August 27…. free stuff, I mean come on!!! In keeping with my most recent trend, I decided to do more nail “art”… taking famous art and turning it into nail art. Its fun, but I could never do these artists justice. Just wanted to get that out there. Today I have for you…. 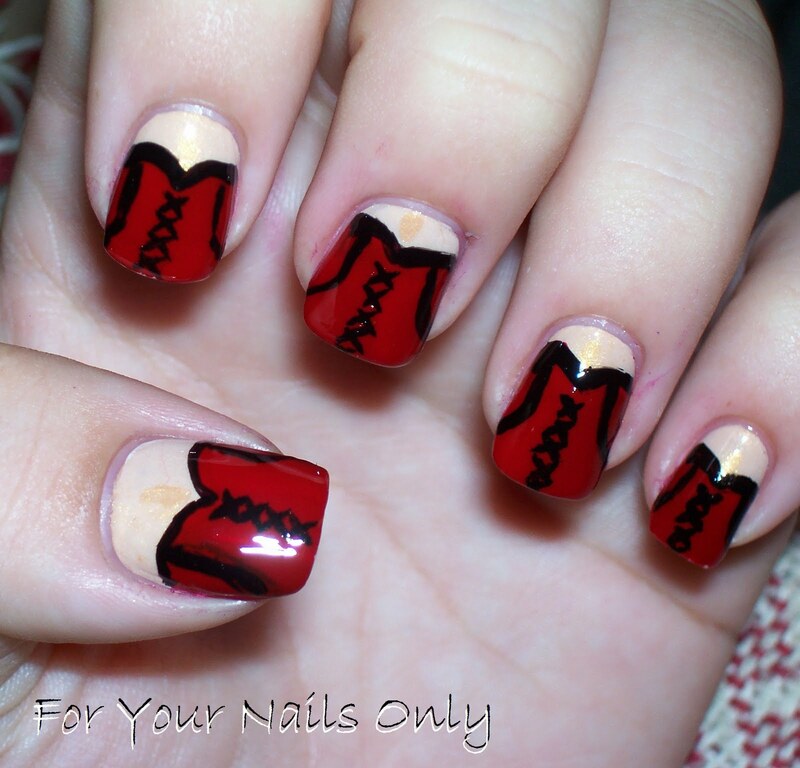 For this manicure I started off with one coat of OPI’s Natural Nail Base Coat. I then did two coats of the following for the bases:No. 7 in Rendevous for the thumb, Sally Hansen Lavender Cloud for the index finger,Essie’s Body Language for the middle finger, Sinful Colors Black on Black for the ring finger, and OPI’s The It Color for the pinkie. Then I used the following colors for details: OPI’s Chop-Sticking to My Story, Sally Hansen’s Blue Me Away, Sinful Colors Black on Black,Essie’s A-List, and No. 7 in Rendevous. Of course I topped off with two coats of Seche Vite. Essie’s Body Language is a slightly off white sort of taupe. It goes on completely opaque in two coats, but has a bit of a chalky appearance at first. The firs time I used it, I really didn’t like it, but it’s growing on me. I loved having it here because Worhol made the Campbell’s design look aged, so it worked well here to give an “antiqued” look for the white. It’d be a great winter color because its fresh but muted. I’m pretty sure I’ve done a review of Essie’s A-List before but I just love this red so much I’ll do another one. This is one of my Holy Grail reds- a red that you know you can always go back to if you need something classy and simple. It’s a berry red jelly and it goes on smoothly and self levels. It’s a bit transparent though and like most reds stains if you don’t wear a base coat. It was perfect for a Campbell’s soup can! Again as reminder for everyone who skimmed over it before, ENTER MY GIVEAWAY and get a chance to win FREE nail polish!! Read the giveaway post below! Thanks!